Update: The fabric will go to Caroline who commented first. Before you get overexcited this isn't a "giveaway" in the usual manner but it is one nonetheless. 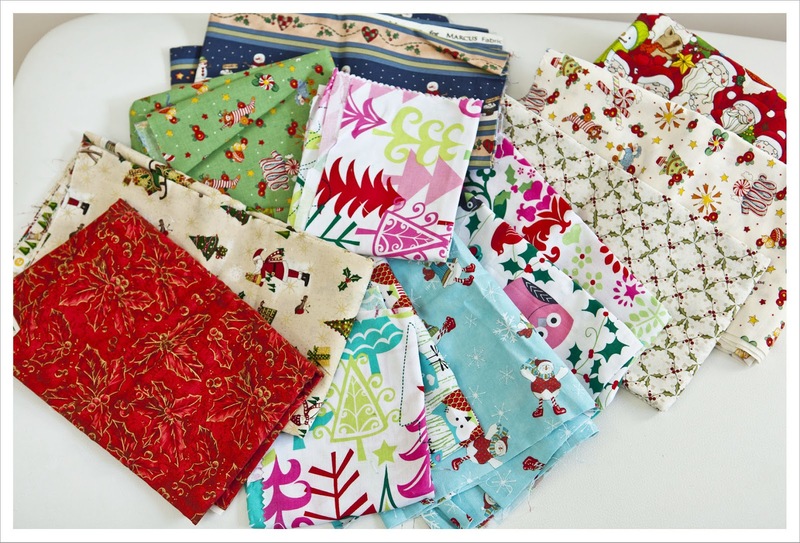 I have a fairly large stack of assorted Christmas fabric to giveaway to anybody who would like it. Last year when I made these Adventcalender stockings for my nephew I at first wanted to make them scrappy from a variety of prints and it so happened that my local quilt shop had a sale where I bought a rather large amount. But then I decided I wanted the calender to be from one collection and when I saw Michael Miller' Christmas collection I couldn't help myself to buy an FQ bundle from that too. On top of that I have already finished my Christmas sewing for this year but that is still a secret for a few weeks. So the long and short of it is that I have a large stash that I would like to give to anybody who would love it for free. All I am asking for is that the postage is paid which amounts to 5 GBP for about 900 gram of fabric for the UK, for the US etc it will be about 15 GBP. As you can see this is a mixture of modern and more traditional fabric, some pieces are half yard, some fat quarter and some less than a fat quarter. Let's do this first come first serve basis. Wow, would love the opportunity to win your gorgeous fabric. Can't wait to see what wonders you've produced for this year. I'm in Wrexham, would I be able to grab some of it? What an amazing idea... or howabout a swap? Have you seriously finished your Christmas sewing??? I'm very impressed! Thank you everybody for commenting. The fabric goes to Caroline who commented first.